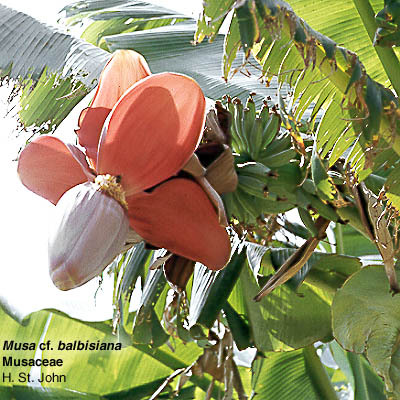 The Musaceae are large, often treelike perennial herbs comprising 2 genera and about 45 species. The leaves are alternate and very large, with the proximal concentric, appressed sheathing portions comprising a pseudotrunk from which the individual petioles and blades diverge. The blades are simple with a prominent midrib and numerous penni-parallel lateral veins. 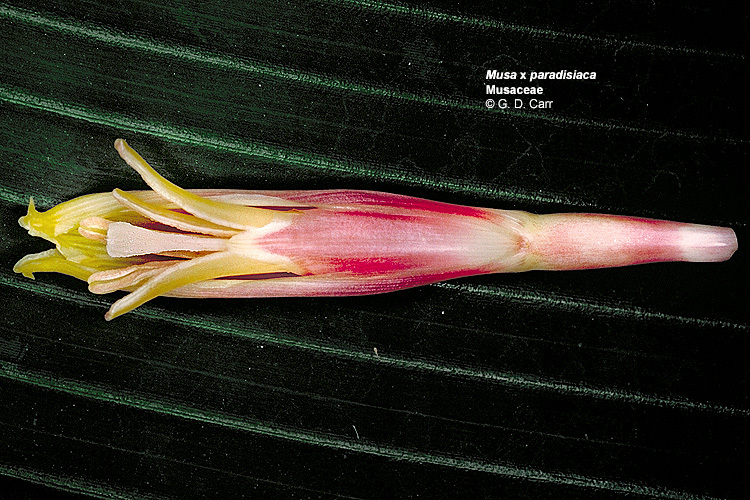 Eventually, an inflorescence axis arising from the corm grows upward through the channel formed by the overlapping leaf bases and produces a terminal series of large overlapping bracts, each of which subtends and hides a cymose cluster of flowers. As each cyme reaches anthesis, the subtending bract reflexes to expose the flowers and eventually abscises from the inflorescence axis. The flowers are zygomorphic and functionally unisexual, the proximal ones being female and the distal ones male. The perianth comprises 2 series of 6 petaloid tepals, 5 of which are connate into a 5-lobed tube leaving one inner segment free. The androecium usually consists of 5 fertile stamens and a staminode that is opposite the free tepal. The gynoecium consists of a single compound pistil of 3 carpels, a single style, and an inferior ovary with 3 locules, each containing numerous axile ovules. The fruit is a berry, usually with a leathery, separable exocarp. Musa velutina, seeded banana. This photo shows fruits developing proximally and functionally male flowers at anthesis near the tip of the inflorescence. 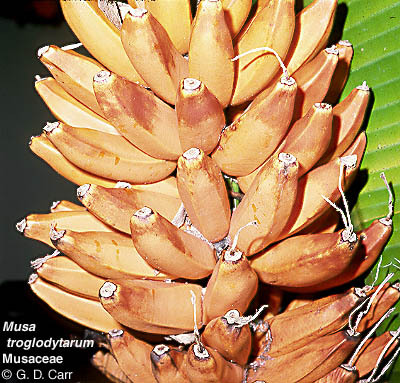 Note the reflexed pink bract subtending the cluster of yellow flowers. Additional clusters of flowers are still hidden by the remaining bracts. 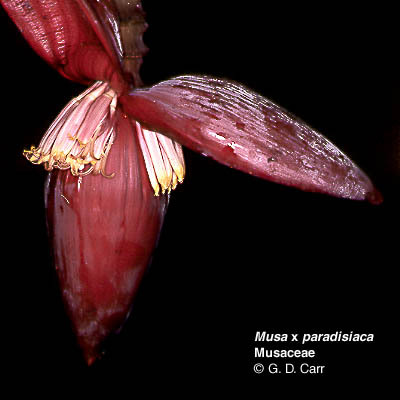 In the photo on the right, the tubular corolla of one of the flowers has been torn open to reveal the 5 functional stamens. 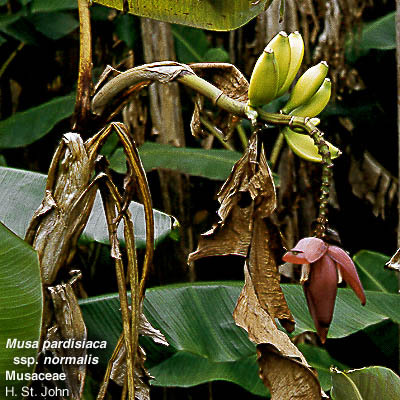 Musa x paradisiaca, edible banana. This is the seedless banana of commerce. Note the developing fruit and the cluster of unopened terminal bracts that hide developing male flowers. In the photo at the top right, the terminal bracts have been peeled back to reveal the functionally male flowers. The lower photo is a male flower. Note 5 functional yellow stamens. There is no stamen opposite the free inner perianth segment which is facing the camera in this photo. However, the cream colored style of the non-functional pistil is in view in the center of the flower. 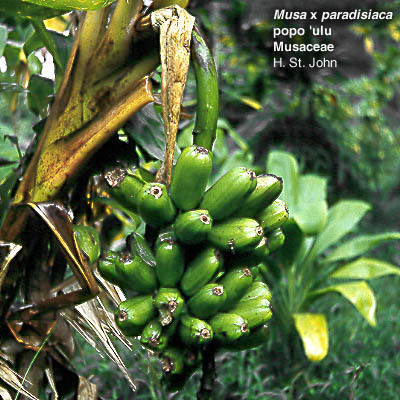 Musa x paradisiaca, popo'ulu. This Hawaiian cultivar was used primarily for cooking. Musa paradisiaca ssp. 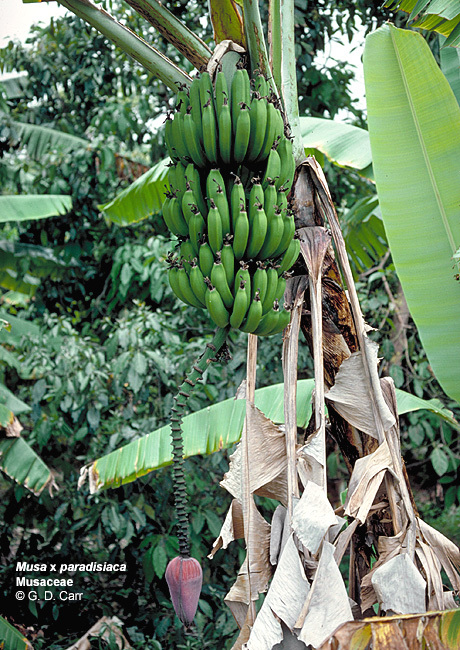 normalis, plantain or mai'a. This is another of the many forms of cooking bananas or plantains grown in Hawaii. 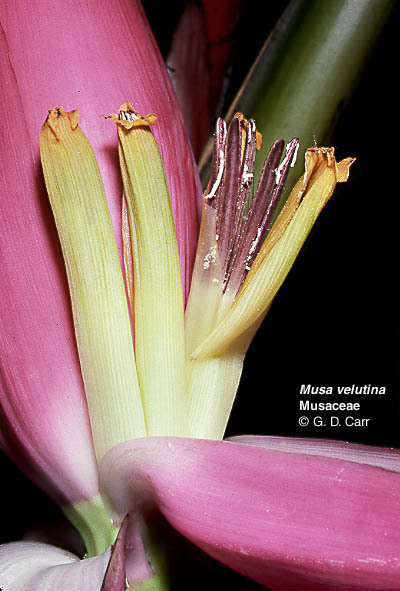 Musa sp. Notice the attractive large orange bracts in this species. A moose (not to be confused with musa). 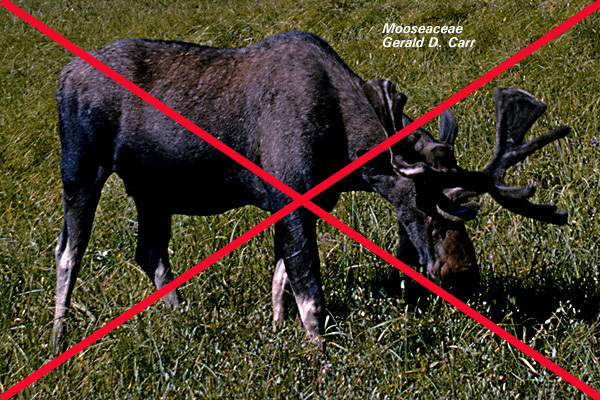 Note the distinguishing antlers.